In our previous blog post, The Edge’s test prep expert and admissions consultant provided their insights on the scores that you need to get into the Top 30 US universities and the best study strategies to achieve those scores. This time, we will be focusing on targeting Top 10 US universities as they require relatively high ACT/SAT scores. Achieving a 33 in the English section on the ACT is approximately equivalent to getting 69 out of 75 questions correct. This leaves very little margin for error. It is imperative for students to memorize the grammar rules that are being tested in this section. In addition, students need to be able to recognize the question type in order to quickly identify the rule that should be applied. If students are consistently missing grammar questions, a quick way to improve in this area is to break down the sentence in question into essential parts: remove non-essential phrases, get rid of prepositional phrases, find the subject and verb. Once a sentence is deconstructed, apply the rules to find any grammatical errors. If students are struggling with rhetorical strategies, try reading the entire passage first. Because these questions depend on the context or the language, having a sense of what the passage is about, and the tone that is established, can help students eliminate the incorrect answers. To minimize errors/careless mistakes, when in doubt, providing a reason why a choice is correct/incorrect can help eliminate uncertainty. Achieving a 33 in the Reading section is approximately equivalent to getting 37 out of 40 questions correct. With room to make only three errors, students must be able to finish this section in a timely manner. This means the first thing students must achieve is to quickly read the passage and process the essence immediately. Many students prefer highlighting or underlining important information in each paragraph. Paraphrasing with students’ own words may help improve their understanding than identifying pieces of information. Summarizing forces students to actively read. Using elimination in this section can also help students minimize careless mistakes. While the passages and the questions are straightforward, the answer choices do not come directly from the passage. Instead, they are often reworded to capture the essence of the passage. If the idea or the tone of the answer choice does not match the passage, eliminate and look at the next answer choice. Lastly, because the passage types are fixed, students can actually prepare by reading articles in those specific fields. Instead of only reading topics of their interest, students should broaden their knowledge by reading into different areas. Many times the faintest familiarity with a topic may just give students the slight edge needed to get the questions right. Achieving a 33 in the Math section is approximately equivalent to getting 54 out of 60 questions correct. Again students need to battle against time to ensure all questions are attempted. With only 6 errors to spare, students cannot make any careless mistakes in the first 40 questions at all, nor can they spend too much time on any specific question. As mentioned earlier, even though the questions tend to progress in difficulty, this does not equate to needing more time to solve. Many of the harder questions simply test students’ understanding of a concept, which means the correct answer can often be spotted right away. With that in mind, knowing the concepts is the first thing students must commit to tackling. It is not necessary to master each concept, but it is important to be able to identify the concept being tested and the mechanics behind it. Students should work to identify their weaknesses and focus on those specific areas. Once students are comfortable with the general mathematical knowledge, they should spend more time on the more advanced question types that occur in the latter section of the test. When students review their exercises, they should focus on how they make mistakes. If students simply cannot understand the question, they should learn about the mathematical concept behind it and the way it is being presented. Students should analyze the process they use to arrive at the correct answer. Solving many of the hard questions requires a correct stream of logical reasoning instead of pure calculation. Achieving a 33 on the Science section is approximately equivalent to getting 37 out of 40 questions correct. Similar to the Reading section, to miss at most 3 questions means students must first be able to finish all 6 passages in 35 minutes. Students rarely have time to double-check their answers in this section. This means students need to focus on speed and accuracy at the same time. While this section focuses on students’ ability to interpret data quickly, it is still important to be aware of some of the basic terms and concepts commonly seen in physics, biology, and chemistry. This means students should prepare by reading general science topics prior to the test. Something students can do to help improve speed and accuracy during the test is to read the answer choices before coming up with the answer. Many question types on this section involve a choice of two possible scenarios with a corresponding explanation. Being able to determine the correct scenario and eliminate the wrong reason can help speed up the process. At the end of the day, this section is more about students’ ability to think critically and quickly. Achieving a 740 in the Math section on the SAT is approximately equivalent to getting 52 out of 58 questions right. This leaves very little margin for error. Students who struggle with achieving this score range normally have one of three main problems: i) they constantly make careless mistakes even though they are comfortable with the knowledge required to answer the questions, ii) they struggle with particular topics and get bogged down when they encounter questions in those topics, or iii) they struggle with the difficult questions. To mitigate carelessness, students need to get into the habit of underlining important information in the question and writing down steps as they work on a question. It is also important for students to ensure that they are memorizing the rules/theorems correctly. Many questions in the Math section require students to simply identify rules/theorems without doing any calculation. However, there are also many trap answers that correspond to the common careless choices. Creating flashcards to help memorize these rules is strongly recommended. For students who struggle with specific topics or difficult questions, learning the question pattern may help reduce such errors. The SAT does not test concepts beyond what it has listed on its website. The difficulty usually comes from the way a question is phrased or the novel way it’s presented. When students make mistakes on such problems, instead of brushing it off, they should focus on analyzing the question and find out how it is different than the types that they can handle. The SAT is about knowledge as much as about preparation. Because the SAT is now more similar to the testing skills learned in school, students should practice with textbooks in addition to mock papers. Achieving a 740 in the English section of SAT is approximately equivalent to getting 89 out of 96 questions right. With room to make approximately 7 errors at the very most, students should focus first on perfecting the W&L section. At the heart of the W&L section is still the application of rules. Students who are getting more than 3 questions incorrect in this section need to first recognize their weaknesses. If students are still struggling with grammar questions, they need to correctly identify the type of questions, and the corresponding rules, that they must reinforce. If the students are struggling with the content questions, they may need to change their strategies in this section. One way to help answer the content questions more accurately is to read the entire passage first. Finally, because this section is really down to finding the right answer, students should use reasoning to support their answer choices. Quite often when we think out loud, we can avoid careless mistakes. If students are able to make at most 1 mistake on the W&L section, this leaves some breathing room in the Reading section, particular for those students who find this section difficult. Mastering the Reading section not only requires good comprehension skills, it also helps when we have some knowledge on the topic being discussed. The type of passages on the SAT Reading section is fixed: there will always be a narrative passage, two science passages, one social science passage, and a US founding document or Great Global Conversation document. While we cannot predict what will be on the next test, we can use past exams to help us find similar passages. In the end, the more the students read, the better they will become at this section. 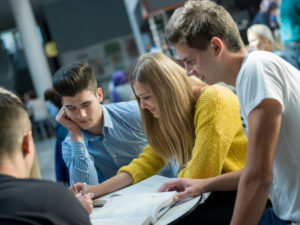 Read more from the previous blog “Getting into the Top US Universities – ACT & SAT Exam Strategies (I)” on the scores that you need to get into the Top 30 US universities and the best study strategies to achieve those score. Need help with your AP/IB coursework? The Edge is offering a FREE Trial Lesson*(English/ Math/ Physics/ Biology/ Chemistry/ History/ Economics/ Business/ Psychology/ Latin) to new students, so join our class and learn how to apply the knowledge you learn in school to your IB/AP/IGCSE examinations. SIGN UP HERE!